Agent for End User Devices 9.1.x offers new functionality, features and improvements in performance. The Agent for End User Devices monitors end user experience by measuring device and application performance. You can deploy the Agent throughout your enterprise to collect data from devices and report to Aternity. See the resolved issues for Agent 9.1.x (learn more), or see details of Agent 9.2.x. Aternity on-premise 11.x requires that devices ONLY run Agent for End User Devices 9.0, 9.1.7, 9.2.x, or Agent 11.0. Agent 9.0.x, 9.1.7 or 9.2.5 ONLY. Agent 9.1.x can now monitor the quality of VOIP audio and video calls on Microsoft Skype for Business or Lync, by collecting a broad set of call data. Call quality in Aternity centers around Microsoft’s MOS measurement (Mean Opinion Score), which assesses the jitter, background noise and other factors to determine the call quality for each participant in a call, on a scale from 0 to 5. Call Details: Use the Call Details dashboard to monitor the quality (MOS score) of calls on Microsoft Skype for Business or Lync on monitored devices running Agent for End User Devices 9.1.x or later, for both for regular Office and O365. Analyze Skype for Business Calls: Use the Analyze Skype for Business Calls dashboard to find correlations that might justify an improvement or worsening in call quality (MOS score) in Microsoft Skype for Business or Lync on monitored devices running Agent for End User Devices 9.1.x or later, both for regular Office and O365. Contact Aternity SaaS Administration to deploy Agent for End User Devices 9.1.x on your devices, and start monitoring Skype for Business today! Agent 9.1.x offers a graphical setup for easy deployment on a single Windows PC, alongside the command line setup for mass-deployments. to evaluate its features, then you can mass-deploy the Agent to all devices in your enterprise. As a SaaS only release, we uniquely customize each setup package for a specific customer of Aternity SaaS. The setup package and the extracted Agent files are secure, signed with our certificate. After you set up the Agent, it can communicate securely with the server using the HTTPS protocol on port 443. Learn more about security. 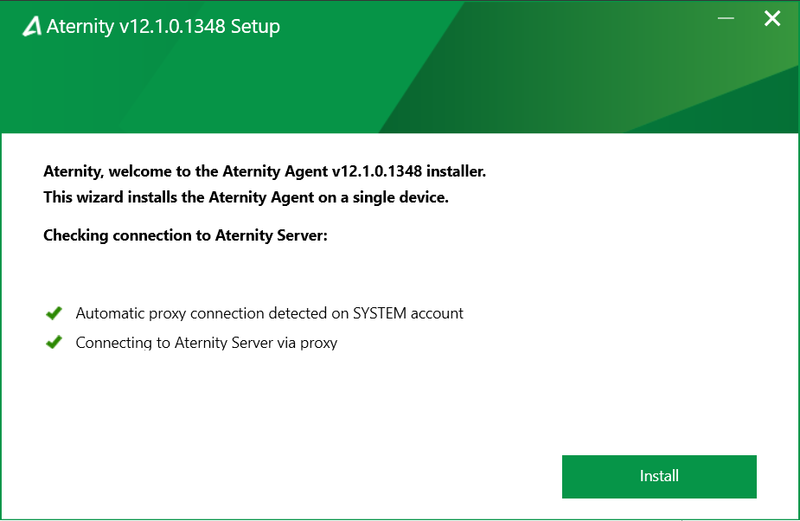 The Agent graphical setup automatically checks if this is a VDI, virtual application or local desktop deployment, and it features automatic detection of proxy servers, so you can connect to Aternity with a single click; just select Install! It also handles less conventional topologies, where you can manually configure a proxy or PAC file to connect to Aternity, and then check for a successful connection before deploying. You can now monitor the health and usage of several web applications within a single site by separating them into distinct managed web applications with their URL path. Add the pathname of each web application to the base URL, to automatically monitor the usage and health of all pages under that pathname. For example, on a single hotel booking site, you can monitor the performance of searching for a hotel (www.mysite.com/findhotel) separately from the payment system to book a room (www.mysite.com/booknow). Agent 9.1.x also measures remote display latency with a new algorithm, offering more stability, accuracy and reliability.